erformance by Molina singh,you are immediately transformed into a world which is dominated by the magic of rhythm......DNA westcoast . Kathak dancer Molina Singh highlighted the navarasas in her choreography. The repertoire of the North Indian classical dance of Kathak lays more importance on pure dance than the interpretative dance (abhinaya). Basically, it is a translation of tabla bols into foot movements. Abhinaya finds expression mainly in the feat of ‘bhaava bataana' only. But when the Kathak trio Apoorwa Wade Bakhsh, Leena Malakar Vij, and Molina Singh performed at the Sreemoolasthaanam of Sree Vadakkunnathan Temple recently, the recital appeared a worthy departure from the conventional repertoire. ‘Stree- Rupa/Anurupa' was a bewitching choreography that strove to highlight navarasas, the essence of abhinaya. Further, it appeared unique as the basic emotions were delineated through select female characters from Indian mythology and history. Interestingly, the three danseuses chose to present each rasa in turn and finally joined together to enact ‘saantha,' the basic one. 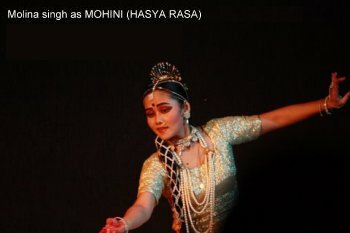 Enchanting dance sequences could be seen in the portrayal of ‘hasya' by Molina Singh. This was based on the story of Bhasmasura. The Asura was hasya incarnate when he obtained the boon from Siva which helped him to reduce to ash any being he could point his finger at. The height of this rasa occurs when he tries to use his boon on Siva himself. And here the transformation of Siva to Mohini who invites the Asura for a dance completion was well depicted. Mohini challenges the Asura to repeat the feats she demonstrated. He executes them admiringly. But finally Bhasmasura imitates Mohini in pointing his finger at his own head and that destroys him. As for roudra, the character selected was Soorpanakha. Apoorwa was all fury as she enacted the demoness tossed between the brothers Rama and Lakshmana. To teach her a lesson, Lakshmana drags her by her hair and cuts off her nose. She turns into the very embodiment of roudra, as she rushes to her brother Ravana asking him to abduct Sita. Beginning with an enchanting Nritta, Leena switched to Menaka, the character chosen for Sringara. Her description of Viswamitra's penance was noteworthy, though short. Perhaps more theatrical was the delineation of all the remaining rasas as appropriate changes in the costumes were effected for better aaharya and abhinaya. Also, ‘aangika' and ‘satwika' abhinaya were more discernible in this sequence. The story of the birth of Kauravas was the anchor for bibatsa (revulsion). The blind-folded Gandhari, infuriated over her prolonged pregnancy of two years gave birth to a big, hard lump of flesh. Disgusted, she tried to throw it away but is prevented by the rishi. It was cut into 100 equal parts and kept in earthen pots leading to the birth of the Kauravas. Molina Singh presented this piece admiringly. For ‘adbutha,' Apoorva chose the anecdotes from Krishna's childhood: killing of serpent Kaliya, lifting of Govardhana mountain and showing the 14 worlds in his mouth. Yashoda's wonder at all these was well enacted by her. The story of a newly married Rajput chieftain who refused to go to the battlefield without a memento that reminded of his beautiful wife, evoked the veera rasa. It threw light on the valour of Rajput women. His wife, Rani Hadi, chops off her head and presents it to him as a memento. The story says that the man tied the severed head on his neck, went to the battle field and faced death. For karunya, Apoorva related the story of Yashodara's travails after being abandoned by her husband, Gautham. Her technique of bringing a sakhi to listen to her had much in common with that usually employed in Mohiniyattam. Absence of rhythm enhanced the mood of the rasa. Molina's depiction of Kali in all its ferocity spoke for her singular abhinaya and also the tisra gati of the rhythm she chose. Her postures of ‘veerabhadra aasana' and ‘uddithapadangushtaasana' helped her to heighten the mood. Music, aaharya and subtle movements of the three danseuses jointly evoked the santha rasa most effectively. The recital commenced with the traditional vandana, in praise of Siva. A sculpture, for a proper understanding, needs to be viewed from nine angles of perception. The sculpture that the Kathaakar team presented was viewed from the angle of nine basic emotions, the navarasas. Stree - Rupa/Aparupa is a peep into the persona of the woman, both what is obvious and what is hidden, what is gracious and what is intriguing. An analysis of the psychological mystery of the woman is carried through the narration and dramatization of known events in the lives of mythical and historical figures of India. For the Kathak trio, Apoorva Wadke Bakhsh, Leena Malakar Vij and Molina Singh, the Kathak mode of dance was just a format to tell tales: tales that are laudable, ignoble, baffling, human, and superhuman. The innovative dance design may be the byproduct of a need to present Kathak without its most important ingredient, its very special orchestra that brings out the soul and spirit of the dance form, its competition between tabla bols and the rhythm of footwork. Travelling to distant places with a number of artistes may not be economically feasible. Dancing to recorded music, the team highlighted an unusual performance in a praiseworthy manner. The presentation as well as the theme was commendable. Stree – Rupa / Aparupa was presented in Thrissur in connection with Sivarathri Festival at the temple precincts of Sree Vadakkunathan. The woman has always intrigued man. In India, she has been either worshipped or killed. The nine aspects of the woman presented in this piece range between these two points. The dance recital starts with Molina Singh as Mohini, the charmer who fooled the arrogant Bhasmasura. Lord Siva showed no discrimination in bestowing boons. With the power of destruction, Bhasmasura becomes a fool, the hasya incarnate. Siva blessed Bhasmasura only to be destroyed by him. It’s the familiar tale, told in all art forms. The enchantress feigns sringara just to make a fool of him. In an amusing performance the enchantress charms the spectators as well. It gives the subtle hint that man has been a toy in her hand. In a classic case of tilting scales, here is the story of Man proposing and Woman disposing choreographed and performed by Molina Singh to her own musical composition. Soorpanakha is the embodiment of deceit in Ramayana. Her real nature is hidden underneath her mask of beauty when she comes to woo the handsome princes. When she fails in rousing Rama and later Lakshman, her innate roopa comes out in the open. The dramatic turn of events give rise to the special flavor of raudra, the anger of a demon, superhuman in dimension. Apoorva presented the strength and power of a mythical character giving importance to abhinaya, to the music composed by Manoj Desai. Sringara has been the weapon that killed many a man in human stories. Menaka, divine in element, tamer of the sage Viswamitra, destroyer of the power of years of thapasya, is the classic charmer with her tool sringara. Menaka in the enchanted forest land of lyrical beauty, flowing rivulets, flowering trees and love birds, trying to provoke the sage is a charming love scene. Choreographed and performed by Leena Malakar to the musical score of Manoj Desai, Menaka remains visually etched in Kathak design. Gandhari, choreographed and presented by Molina Singh, was a surprise indeed. Gandhari, the wife of Dhritarastra blindfolded herself to remain a pathivritha. The cries of Gandhari, the archetypal mother who lost her sons have echoed in the battle fields ever since Kurukshetra. In the dance recital, Molina Singh projects the hidden facet of the woman who lived to be the queen. 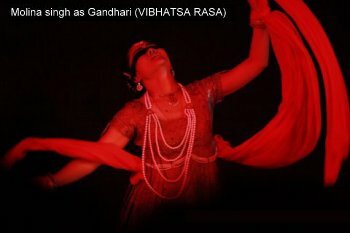 In a stunning theatrical performance regulated by her musical composition, only one emotion, bhibatsa (revulsion) is displayed in great intensity. The pregnant queen devastated by the news of the birth of a son to Kunthi, is in a towering rage. Like burning fire, her anger induces labor pains. Convoluted in self-induced birth pangs, she delivers a lump of flesh. The writhing labor pangs on the stage in special costume highlighted the drama. Disgusted at the sight of the mass of flesh that she delivered, she throws it away in repulsion. Gandhari, in her costume of blood red and black emerges a part of dramatis persona rather than the usual Kathak dancer. The orchestration of the rasas reaches its peak in Gandhari that Yasoda comes as a welcome relief. Once again, Apoorva presents a curious angle to view Yasoda, the indulgent foster mother of Krishna who has spoilt her naughty darling. For Yasoda, the boy who killed the serpent Kaliya, who lifted the mountain Govardhan, evoked only wonder. It is the sense of wonder evoked by her lovable rascal of a son that makes Yasoda such an indulgent mother. Indeed the culminating point is when she asks him to open his mouth to test whether he has eaten mud -Viswaroopa darsan! What emotion should it bring, other than adbhuta! A beautiful recital of the celebrated mother-son relationship drenched in vatsalya set to music by Manoj Desai stole the heart of Krishna lovers in Thrissur. The Rajput clan has special place in Indian history. Made of brave mettle, the Rajput women have evoked admiration for their bravery and sacrifice. The story of Rani Haddi married to the chieftain of Mewar is rather unknown in Kerala. The gory tale of presenting her head as a memento to rouse her husband to the battlefield sounds bizarre to today’s audience. But such were the women who made history for us in India. Choreographed and performed by Leena Malakar to the music composed by Molina Singh brings to light veera as the basic emotion although Sringara was quite fascinating in the scenes of conjugal bliss. Karuna rasa, the core value of Buddhist philosophy is epitomized in none other than Yasodara, the wife of Siddhartha. Renounced by her husband, Yasodara follows the path of the Buddha, renounces worldly pleasures but remains duty bound to rule the kingdom for their son, a true karma yogini. As she lets the bird out of the cage, out of her hand to skyward, the theme of liberation is suggested as the undercurrent of her story. The technique of bringing sakhi on the stage proved singular for dramatization. Yasodara, choreographed and executed by Apoorva set to the scores of Manoj Desai is the most dignified lady in the trajectory that the persona of the Indian woman has left behind. Kali is another character that is defined by aharaya. In an experimental mode, quick-paced thandava dance, black costume, and music close to chanting, sculpt Kaali, the Goddess of Death in awesome ferocity. In the hearts of the ignorant mortals she plants fear. Choreographed and performed by Molina Singh set to her own musical composition, Kali emerges as a power enveloped in bhayanaka rasa, which negates everything that life offers. Santha, peace, is the boon of Nature. Life giving, life sustaining water has brought civilization, culture and peace to humans. A group performance set against the music of waters, the last item heightened the symbolic. Once again, aharaya plays a role in this experimental piece. Clouds gather, raindrops fall in rhythmic beat, growing in intensity, rivulets grow into rivers and flooding and flowing seaward merge in the oceans. Our philosophy was born from the realization of the eternal cycle of life. And peace is born from its acceptance. In a lyrical performance set against the orchestra of the waters, the audience experienced peace, santhi, the peace that passeth understanding. Sanatombi, a girl from Imphal, Manipur, is in Delhi, having received a scholarship from the culture ministry to learn Kathak. After her first day at the dance school, she is back at the house where she lives as a paying guest. Her mother, a veteran Manipuri dancer, calls from Imphal to ask about the class. “I don’t know whether it was a good decision to come here,” Sanatombi says. The next morning, as she prepares to leave for the dance class, she looks in the mirror, at her eyes and nose. She pinches her nose with a clip to make it sharper, till she almost faints from the pain. Her mother calls. Sanatombi tells her that she is in pain. After a particularly traumatic experience in a market, Sanatombi wants to return to Imphal. When she is asked to perform a Manipuri dance at a function, she uses the opportunity to give her compatriots a little lesson about her home state, including the fact that Chitrangada, the bride of Mahabharata’s Arjun, was from Manipur. Sanatombi’s experience, lived through by many Indians from the country’s north-east, is shared by Molina Sushant Singh, the Mumbai-based Kathak dancer who played the protagonist in Nahaakgee Nungsirabi (Local Foreigner), a play performed on Tuesday as part of the Zindagi theatre section of the Hindustan Times Kala Ghoda Arts Festival. The play received a standing ovation from the audience. “I liked the simple way in which the play delivered the message that people from the north-east are Indian and they are badly treated in other parts of the country,” said Rajarshi Banerjee, a theatre director who attended the show.